To round out what was an epic week in October, the third massive dinner I went to was the Must 10th Birthday Dinner. I am on their mailing list so saw details of this one on their event listings. Sounded delightful. They always have some impressive sounding dinners and with the exception of a Christmas Party I’d never been there for a meal. So I jumped at this opportuntity…. and GG is an easy sell on a delicious dinner out. So tickets were booked and the calendar was marked. I was all the more excited when the date rolled around after the brief visit on the Monday previous for the Beaufort St Festival Roving Dinner (http://perthmunchkin.com/2011/10/29/beaufort-st-festival-roving-dinner/). The visit then for canapes and champagne had been entirely memorable and wonderfully delicious. The guests for the birthday dinner were seated in the private dining room at the back of the restaurant. So there would have probably been around 60 of us I would have said at a guess, sat along 3 long tables. The night began with a brief introduction by Russell Blaikie who outlined what we would be eating. The head sommelier then talked us through the wines. So we were given a glass of Henroit “Souverain” Brut NV Reims Champagne as we entered and knew that the first offering was to be canapes. 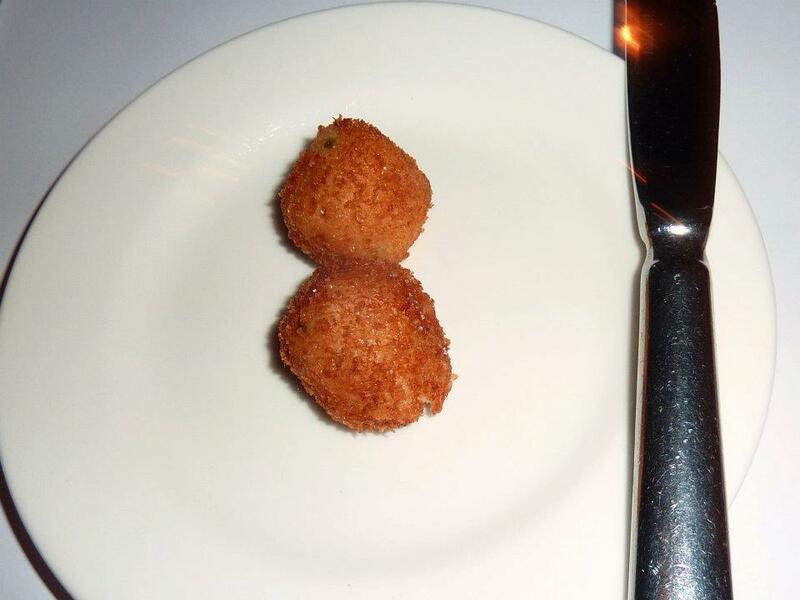 The looked fairly familiar to the ones we had the previous visit….a croquette of sort. Very tasty, but the dilemma was that the timing was a little out so our glass of champagne was long gone by the time the deep fried goodies arrived. It sort of created a bit of a lag with the other courses and their matched wines. Moving right along the first course was Mount Barker Chicken Liver Parfait with Manjimup Black Truffles , Alsace Riesling Jelly and Toasted Brioche. This came with a JL Wolf ‘ Wachenheimer’ Rieseling 2008 from Pfalz in Germany. 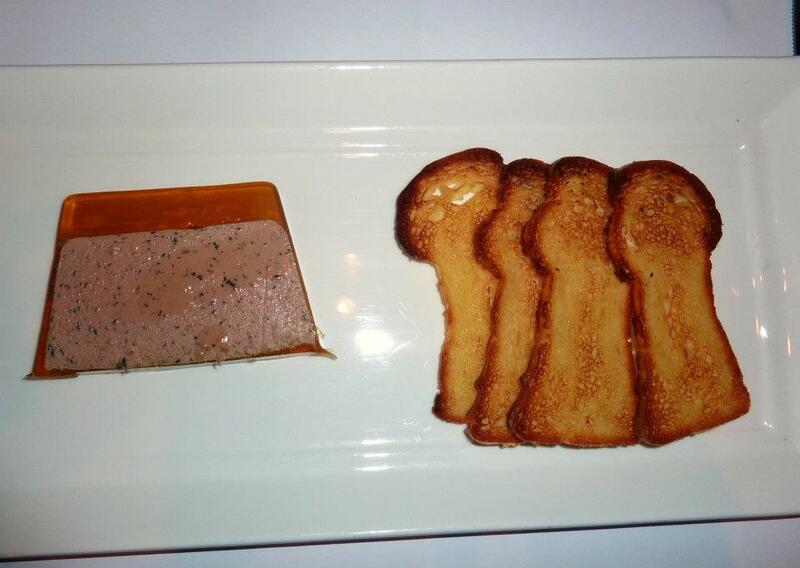 Now I’m not the biggest fan of pate so I wasn’t sure what I’d make of this dish. 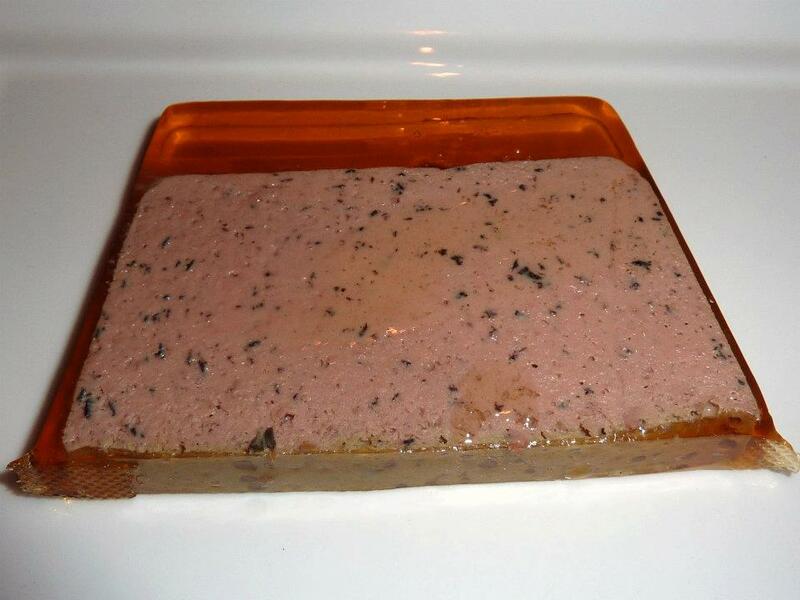 Now as pate goes it has a pleasant enough flavour and from the happy sighs around the table I could tell that it was well received by others, but pate is not that high of the list of my favourite things. I focused more of my attention on the baguette and butter that had been placed on the table. 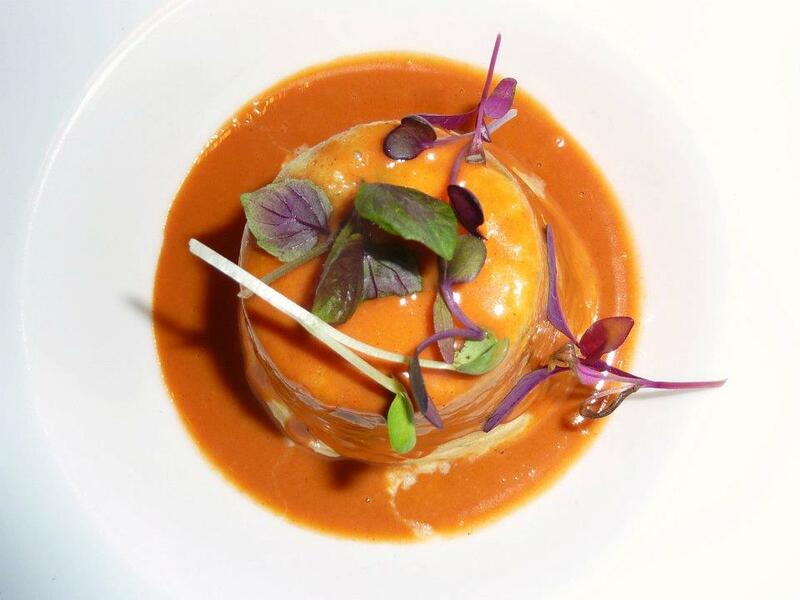 Following this was a Twice-Baked Lobster Souffle, Lobster Bisque and Armangnac Sauce with a Kumeu River “Mates” Chardonnay 2008 from Kumeau in New Zealand. It presented beautifully and had a light, fluffy and smooth consistency. 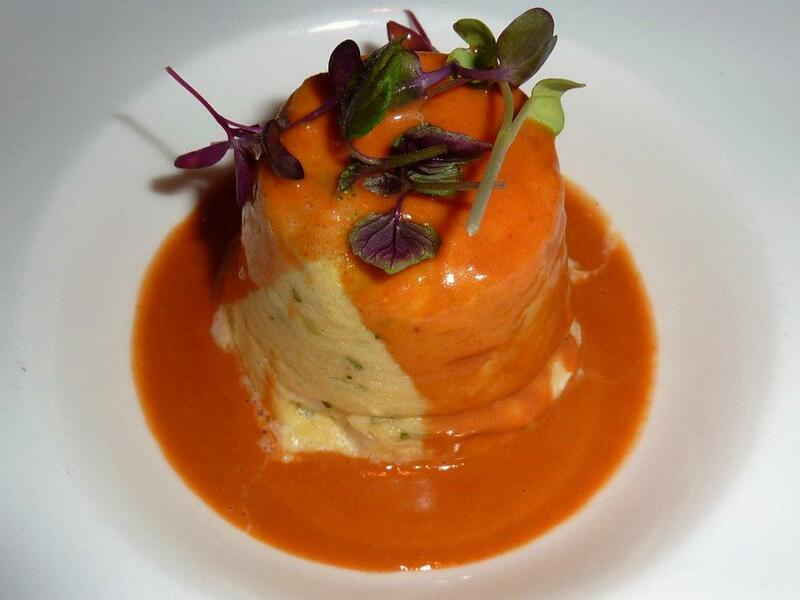 The souffle itself was indulgently flavoured with Western Rock Lobster. I did enjoy it a lot. 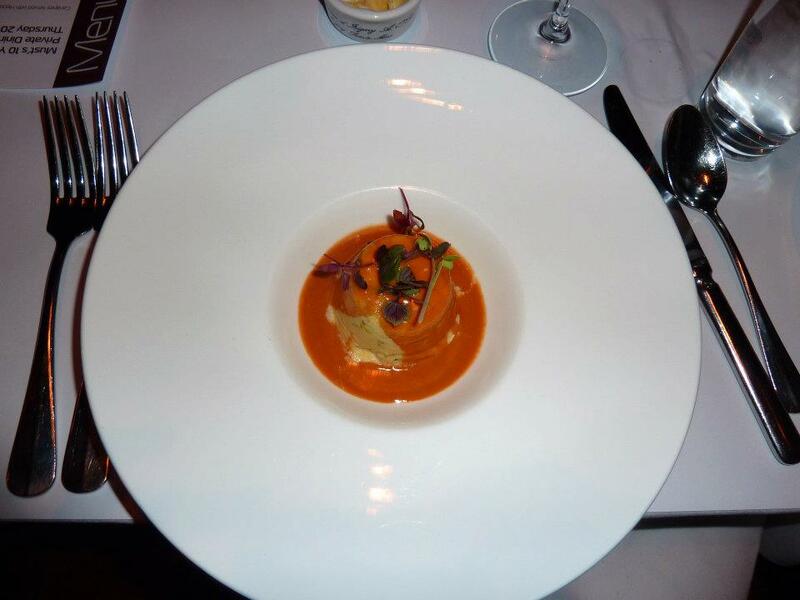 The bisque was probably slightly more seafoody than I tended to favour but it was something different and said to be a quintessential Must dish and we were told it was a battle in the kitchen as to which chef prepared the best twice-cooked souffle! 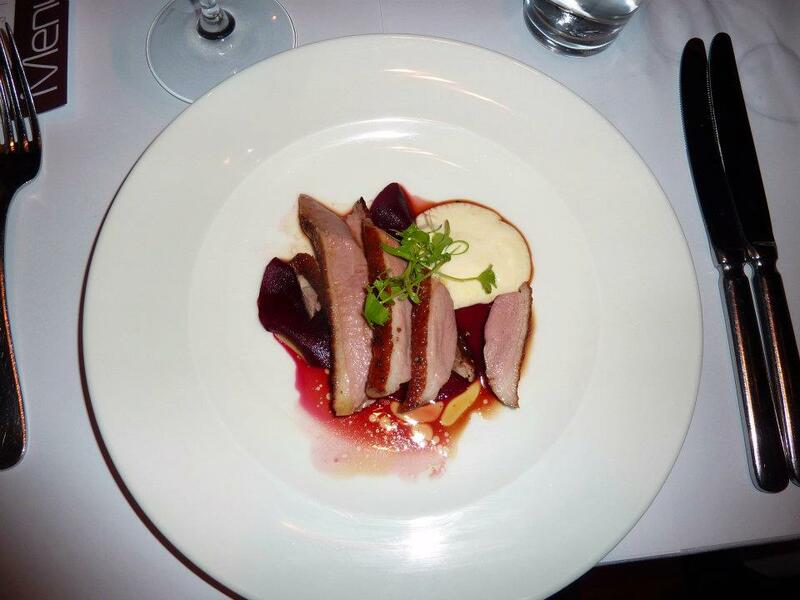 And after the lobster came a Tea Smoked Duck Breast, Marinated Beetroot and Organic Feta Whip served with a Ata Rangi Pinot Noir 2009 from Wairarapa in New Zealand. It will unlikley come as a surprise to anyone who has read a few of my posts this year that I have a lot of time for duck. The combination of flavours in this dish worked a treat. 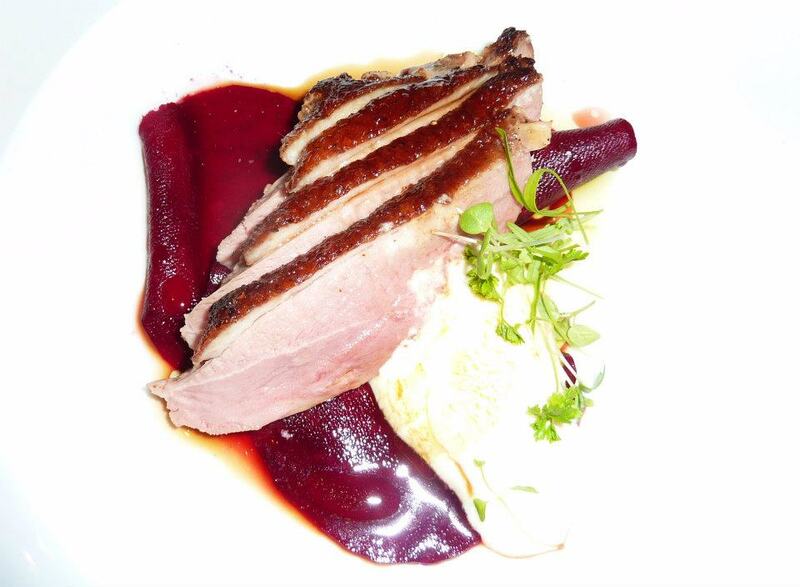 The sweetness of the beetroot and the smoothness of the feta cheese with the pink duck breast it was one favourite courses. I was surprised that a pasta course was scheduled for so late in the evening and I was feeling a little on the fuller side by this stage so was a little daunted. 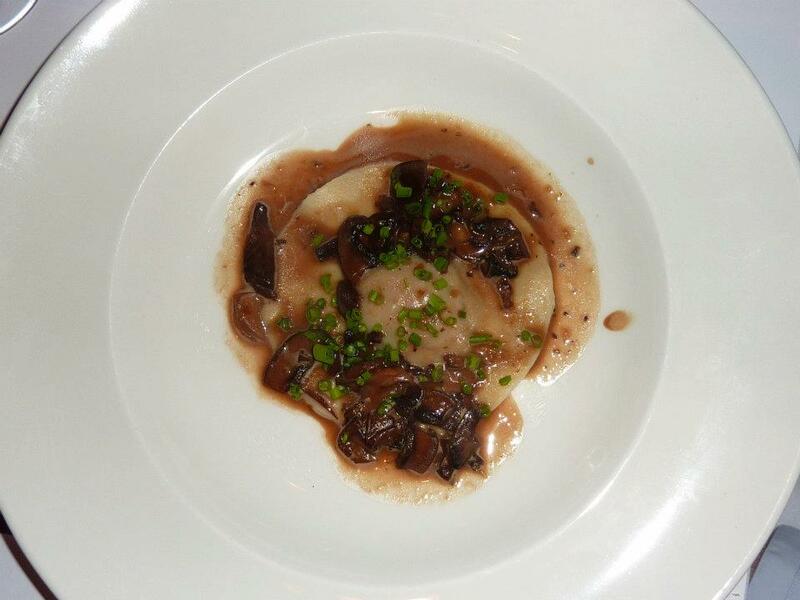 But an elegant single ravioli was presented – White Rocks Veal Shin Ravioli, Wild Mushroom Creme and Truffle Oil with a Seppelt’s St Peters Shiraz 2007 from Grampians in Victoria. There was a strong mushroomy flavour to this dish (unsurprising given the menu description I suppose 🙂 ). 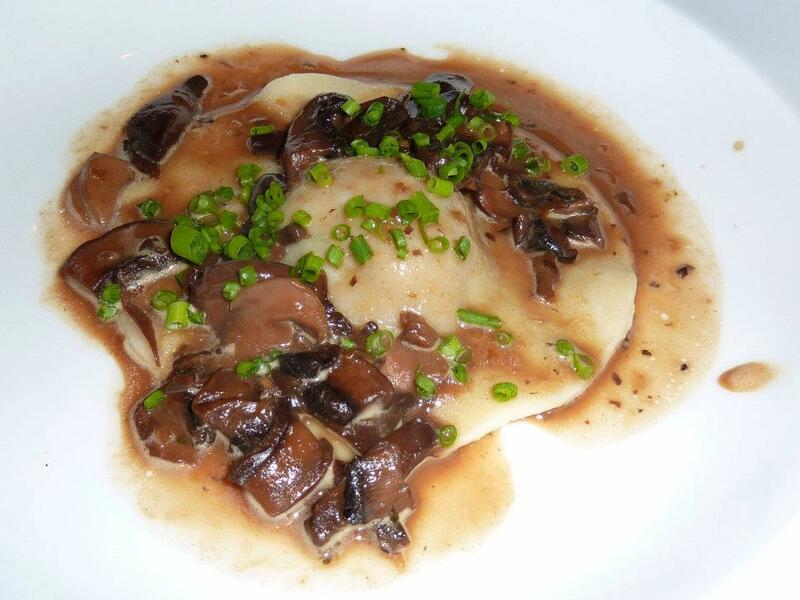 The meat in the ravioli was delicious, but I found the pasta a little on the chewy side which was slightly disappointing. I thought they were right on size wise with this course though. 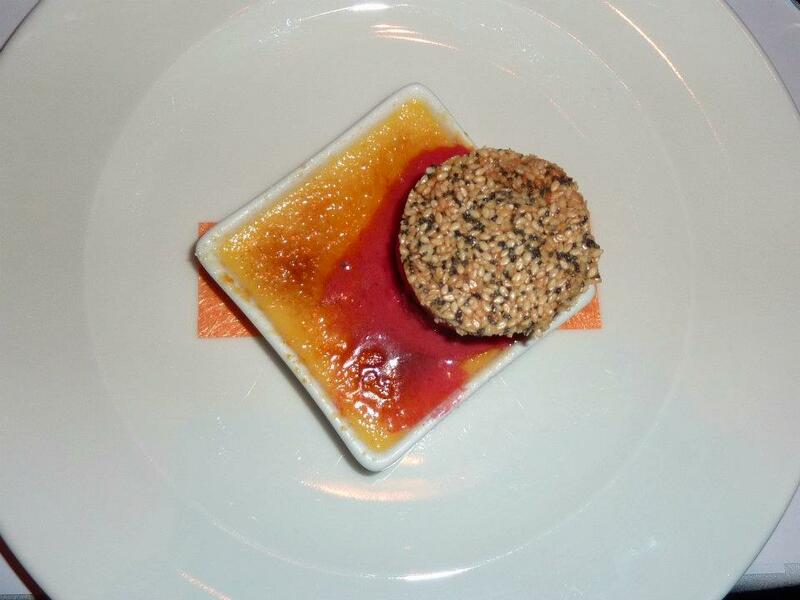 And finally with just a little room to spare dessert arrived – Orange and Vanilla Creme Brulee with Raspberry Sorbet Sesame Snap with two desserts wines, a Domaine Disnoko Aszu 5 Puttonuos 1993 from Tokaji in Hungary and also a Oremus Aszu 5 Puttonyos 2002 from Tokaji in Hungary. This dish was very similar to the one I’d had for the work christmas do that I’d been to at Must. 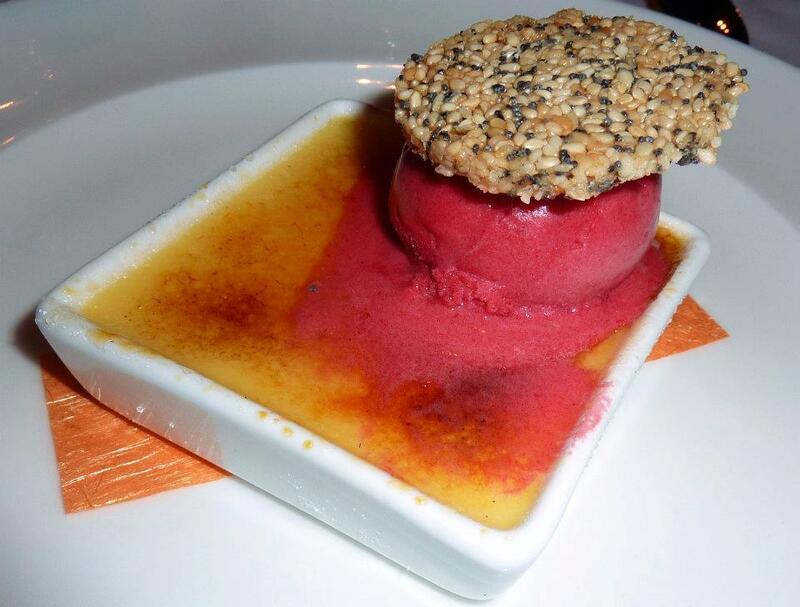 They do a very good brulee and I quite liked the raspberry sorbet to cut through some of its sweetness. 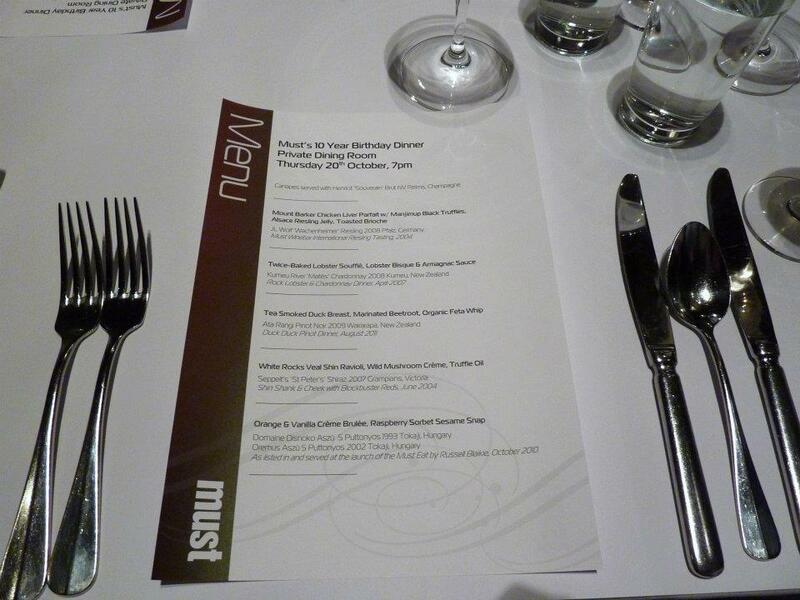 In all the food at Must was entirely well prepared with some amazing flavours and the service had been good, albeit the slight timing issues with the wines…. however I think I had my expectations too high for the evening after the visit the few days prior. I found myself more impressed by the canapes and champagne that I had on the Monday night than by this dinner. I also found that it was incredibly loud in the private dining room. Despite this, I wouldn’t be detered from another visit to Must, they have incredible experience at making french bistro food and an epic wine list. Perhaps it just wasn’t my night to be blown away. I love the chicken parfait from must! Excuse the pun but every time i go there i must order it!